Yesterday evening was (initially) very clear. I took the opportunity to image the USA 144 decoy (1999-028C) in the early evening, and then do a survey of the eastern geostationary belt between 23h and 24h LT. 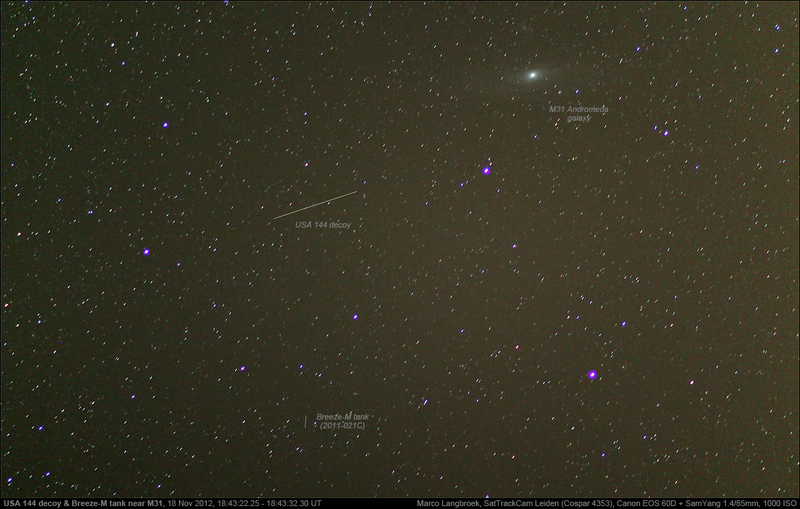 The session on geostationary satellites later in the evening was ended by incoming cirrus, but not before a fair number of objects was imaged. 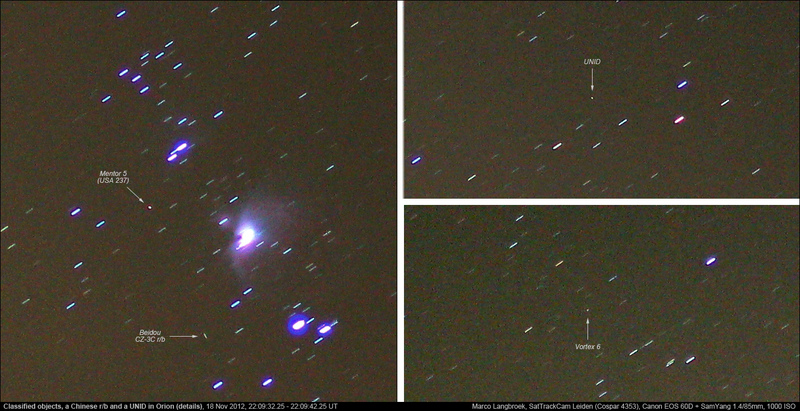 Among them was a bright unidentified object in an 8-degree inclined (near-) geostationary orbit captured in several images. 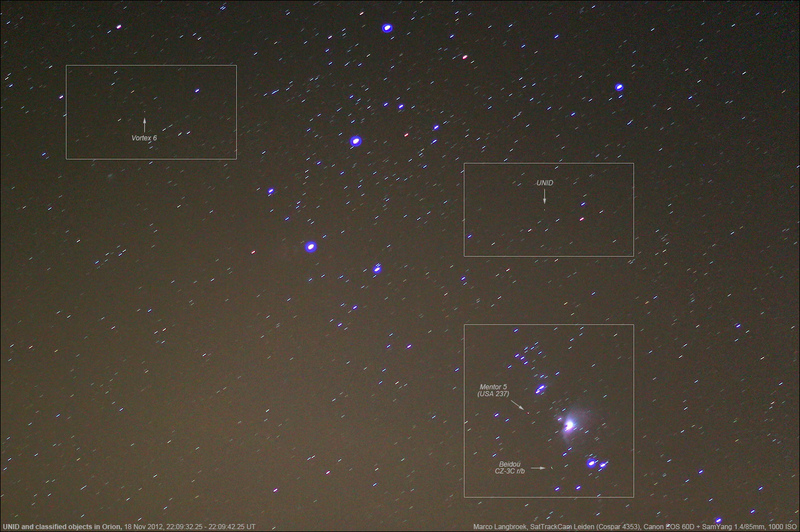 The images below (overview, and then details) show it in Orion together with the Orion nebula, a Chinese r/b (Beidou CZ-3C r/b, 2010-024B), and the classified SIGINT objects Mentor 5 (USA 237, 2012-034A) and Vortex 6 (1989-035A). While the object is unidentified at the moment, it probably is a commercial geostationary satellite that is being moved to a new slot or to a graveyard orbit: but with the tracking network of USSTRATCOM not having noted this yet. Initially, I thought it might be the same "unid" reported by Greg in the same general area the day before, but it turns out to be another object. Greg's "unid" was identified by Mike as 2010-024B, a Beidou CZ-3 r/b, actually the same object that can be seen close to USA 237 in the images above. UPDATE 19-11-2012, 20:20 UT: Greg Roberts just mailed me that he recovered the UNID from South Africa at virtually the same position, so it is geostationary. See follow-up post here. Is it a bird, or a possible UNID satellite?